Fine. 0751541958 ALL BOOKS SHIPPED WITHIN 1 DAY OF PURCHASE! Very Good. 0751541958 ALL BOOKS SHIPPED WITHIN 1 DAY OF PURCHASE! The book was amazingly touching, this story follows the Notebook in a beautiful way! I would highly recommend it to all!! I'm a big Nicholas Sparks fan, so I may be somewhat biased as I review this book. THE WEDDING is the sequel to THE NOTEBOOK, the love story of Noah and Allie: a love that almost didn't happen. Now, in THE WEDDING, we meet the next two generations of family members, and a somewhat complex story is told. As the wedding plans take shape, Wilson keeps Noah up to date. During their visits, Wilson notes how Noah dotes on the swan, talking to her and sharing his thoughts with her. A few odd events almost convince Wilson that maybe this is indeed Allie reborn, but he always keeps these thoughts to himself. And all through these visits, Noah reminisces about his wife, while Wilson remembers his own first love Jane. 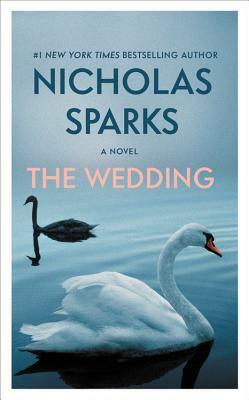 The title THE WEDDING is misleading, but this was Sparks' intention. Yes, the entire book is about the family getting ready for the big wedding, but the reader will realize by the end of the book that the story is much more than just THE WEDDING. The ending will surprise you, as it surprised some of the characters in the book. The story of the swan helps round out this tale of eternal love and may turn even the most cynical of persons into a romantic. Although this book doesn't have a complicated story line or much action (it is a romance, afterall), I ended up being pleasantly surprised by it in the end. Jane, the daughter of Noah and Allie from The Notebook, and her husband, Wilson, are called upon to help plan their daughter's hasty wedding, which happens to coincide with their 30th anniversary. Unfortunately, he had forgotten their 29th anniversary and he realized then, that he had been taking his marriage for granted. He sets out to make his wife fall in love with him again. It's a simple plot, and yet, it's not simplistic. Over such a long period of time, habits become ingrained. It's not easy to change. The fact that Wilson is shown to work at it over the space of a year shows he's serious, and that he doesn't believe his years of neglect can be atoned for by one romantic date or expensive gift. Like most of Sparks' books, he asks a question at the beginning, that is answered by the end of the book. He uses humour well, and he has interesting insights into the real issues of being married for a long time. Men don't have to understand women, but they do need to know their own wives. A lifetime of study should give him enough information to know how to make her happy. This story ended satisfactorily, with Wilson giving Jane something she's always wanted. I thought I saw it coming, but it had a slight twist that made it even better. This book suggests that life changes can be made at the most surprising times. New characters keep the memories of "The Notebook" characters alive in this book. A very endearing read. It tells us a normal story, but with beautiful language, deep feelings and unique insight. Love, is treasure that can not buy by money. In our real life, we usually ignore the importance of love. Only when we lose it, do we realize its importance, and regret what we did. In this novel, Nichlas Sparks gave Wilson a chance to rescue his love, and also gives us an alarm and hope. Strongly recommend!